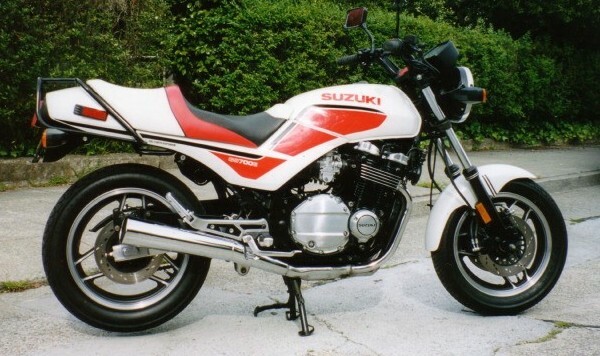 I’ve been riding motorcycles since the early ’80s, when Rich encouraged me to buy a 1979 Suzuki GS750 and taught me to ride. That bike was a beast – the Superbike of its day, powerful and top-heavy. I naively tried to take the skills test for my M-1 endorsement on it – I dropped it during the test and was so humiliated that I rode illegally for years until I got a more suitable bike and tried again (successfully). Shortly after we bought the 750, Rich found himself a nice 1982 Suzuki GS1100ES. We toured quite a bit on those two bikes, and the 1100 was what he used to enter his first few endurance rallies. He soon got hooked by the whole endurance rallying thing and traded the trusty 1100 for the rally bike-du-jour – a 1991 BMW K75S. 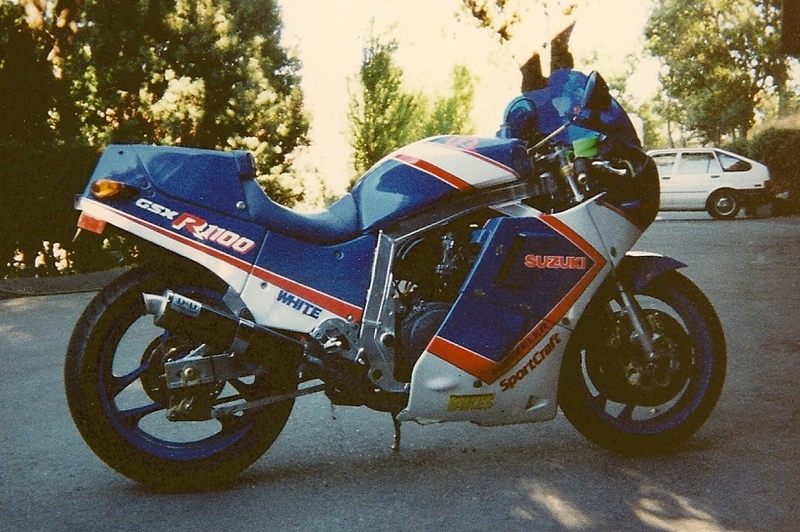 In the fall of 1990, he and I took the 700 and the GSXR to Reg Pridmore’s C.L.A.S.S. riding school at Sears Point (sorry, it will never be Infineon to me) and we had a blast. The next day, armed with my new skills and confidence, I took the bike out to the Marin County coast on the Sunday Morning Ride and had a great time … until I ran out of asphalt exiting a corner. I left the pavement and rode up the embankment, valiantly trying to save it and return to the road. Unfortunately, I hadn’t learned any dirt-riding skills at C.L.A.S.S. and about the time I acknowledged that, the embankment became vertical and I crashed. My bike and I landed upside-down in the ditch. Fortunately, our friend Peter Corlett was not far behind, and he stopped to help. Once he had determined that I was not badly injured, he exclaimed enthusiastically (in his Manx-bred British accent) “That was awesome! You looked like you were riding the F@#&ing Wall of Death!” Where was Rich, you ask? Way ahead of us on the GSXR, because that’s where he always was on the Sunday Morning Ride. The injuries to both me and the bike were relatively minor – my left side was bruised from hip to mid-thigh, and the windshield and instrument cluster on the bike were smashed. We did some rudimentary triage and determined that the bike was rideable and I was able to ride it, so Peter and I limped toward home. Just a few miles up the road, we encountered all manner of emergency vehicles and crash debris – another friend on the ride had collided with a bicyclist and both were seriously injured. I asked enough questions to determine that Rich wasn’t involved, and that he had headed home to get the truck and trailer to retrieve our friend’s bike. Peter and I continued on toward our house, and finally met up with Rich about halfway home. Naturally, he was oblivious to my plight, so there I sat at the stop sign like an idiot, pointing at my smashed instrument cluster and whimpering “I crashed, too!” His response – “Oh, so you did.” He did his best to exude an appropriate amount of sympathy, but even my narcissistic self couldn’t deny that our friend’s plight was much more serious. He said “I’ll see you at home” and we parted ways. But I digress. I fixed the bike and held on to it for a while. But then my father died in 1996, exposing the harsh reality that I was the only family support for my aging mother. I never really had the passion for riding anyway, and suddenly, I found that risk-taking had taken a crystal-clear back seat to the potential for elder-care. It was time for me to grow up, so I decided to sell the 700. 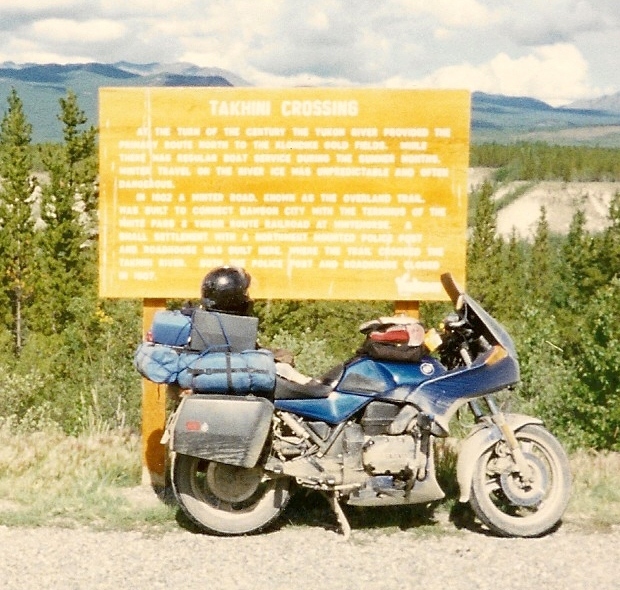 In the meantime, Rich used up the K75S with several rallies and a trip to Alaska and traded it in for his next rally bike, a 1998 BMW R1100GS. He had also fallen in love with the 1998 Honda 996 SuperHawk (as a replacement for the aging and slightly-too-aggressive GSXR), flew to San Diego to buy a barely-used one and rode it home (crashing on the way, but that is a separate story). He managed to convince me that I could handle it if I needed a riding ‘fix’. And then in early 2009, he decided that the R1100GS was no longer a suitable rally bike (translation: it was too tall for his aging knees to reliably get on and off of after 20 hours without sleep), so we bought a 2009 Honda ST1300. Fast forward to mid-2009: by the time the whole bike shuffle was over, we had three bikes in our garage: a BMW R1100GS that I could barely touch down on, a Honda 996 SuperHawk that scared the crap out of me, and a really fancy Honda ST1300 that I didn’t dare even swing my leg over. By then, my personal circumstances had also changed – having lost my mother in June 2008, my elder-care responsibilities had evaporated. Before you get all judgy and assume the worst of me, let’s be clear on the circumstances: she lived a full and independent life until she succumbed to a series of resistant infections and resultant kidney failure at age 93+. Not many parents survive well into their ’90s with all of their marbles, so as unfortunate as it was, I can’t feel too sorry for either her or myself. After dealing with that, I found myself with the freedom to open my mind back up to motorcycles. And if you’ve been keeping score, you’ll agree that I was long overdue for a turn to get what I wanted – the last bike I had chosen for myself was back in the late ’80s. You can guess what the next installment will be – decisions, decisions, and what I ended up buying. Finally, a motorcycle just for me! This entry was posted on Friday, July 9th, 2010 at 10:34 pm and is filed under Motorcycles and Me. You can follow any responses to this entry through the RSS 2.0 feed. You can leave a response, or trackback from your own site. I’m blown away by all you’ve shared about rallies and riding them.